soothe is a spectral processor for suppressing resonances in the mid and high frequencies. It automatically detects the resonances in the audio material and applies a reduction that matches the input signal, saving you from having to manually notch the problematic frequencies. 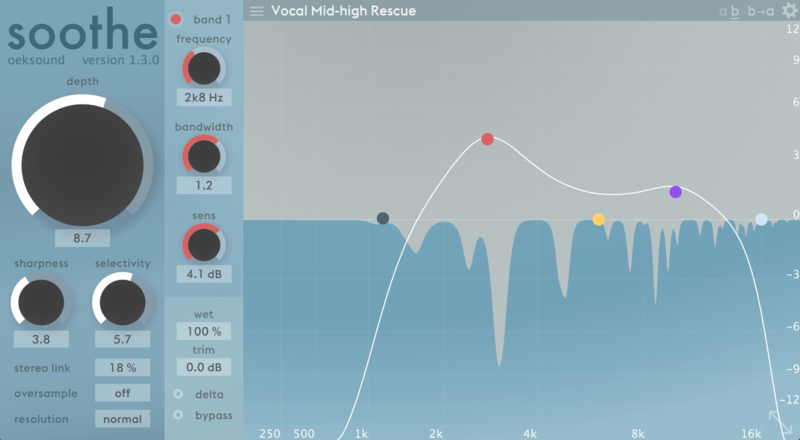 soothe can be used where a traditional de-esser, dynamic eq or multiband compression would be, it just works better. It is equally at home on individual tracks as well as on sub mixes and master bus. The modern and informative user interface let’s you tackle problems with never-before ease. You can see the exact processing that takes place with the real time OpenGL accelerated frequency graph. Years of R&D have resulted in an artefact-free process. You hear only the effect with none of the problems of the other approaches. soothe has no crossover-artefacts or pre-ringing. soothe is available in all major plugin formats for all DAW platforms for Windows and Mac. Free iLok account required. Online access required for the initial activation of the product and trial. One licence allows activation of the product on 2 machines. Licences are valid for both Windows and Mac OSX platforms.